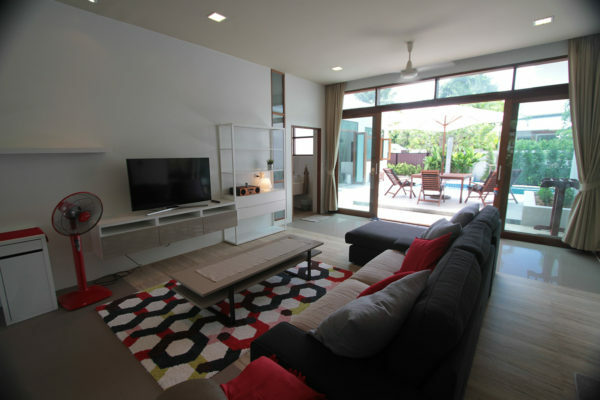 Niwana Breeze Villa is modern and spacious, characterised by the interconnected breeze lounge at the centre of the space to allow air flow through the building. 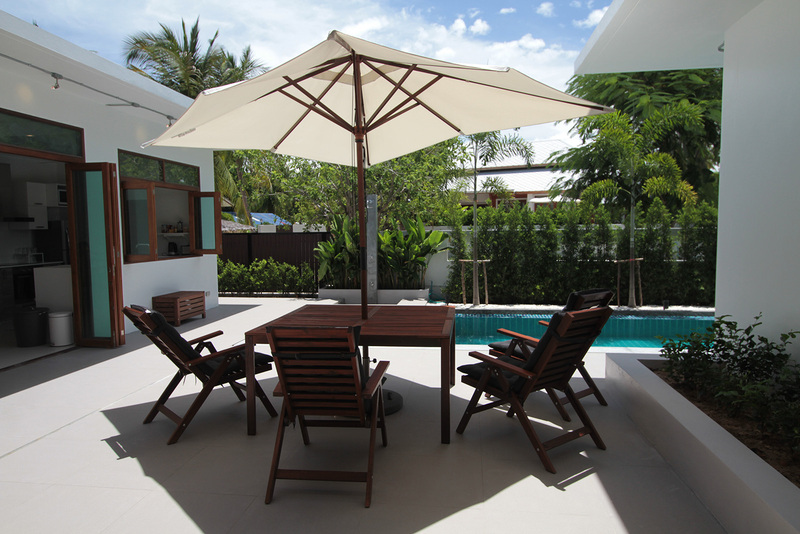 The breeze room leads to an outdoor dining terrace around the 10 metre swimming pool and adjoins a stylish kitchen with indoor dining making a perfect living area to enjoy the climate on Koh Phangan. The master bedroom, with ensuite bathroom and walk-in wardrobe, opens onto the pool which includes beanbags and sun loungers with parasol. 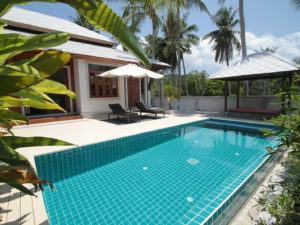 Niwana Breeze Villa is a modern and spacious 3 bedroom villa in the coconut garden, within easy walking distance to the old market town of Thongsala; the place where most of the boats arrive and depart. The main features of the villa would be the interconnected breeze lounge room in the middle of the space – to allow the air flow through the building – and the 10m private outdoor swimming pool complete with outdoor dining terrace and sun loungers with parasol. The kitchen overlooks the pool which has garden beds either side to provide privacy and shade. The breeze lounge is the heart of the villa; all the rooms and areas flow out from the lounge. At the main entrance side of the breeze lounge there is a morning sun patio and tropical garden feel; while the other side leads to the outdoor dining terrace seating four people and 10m private swimming pool and adjoining kitchen. 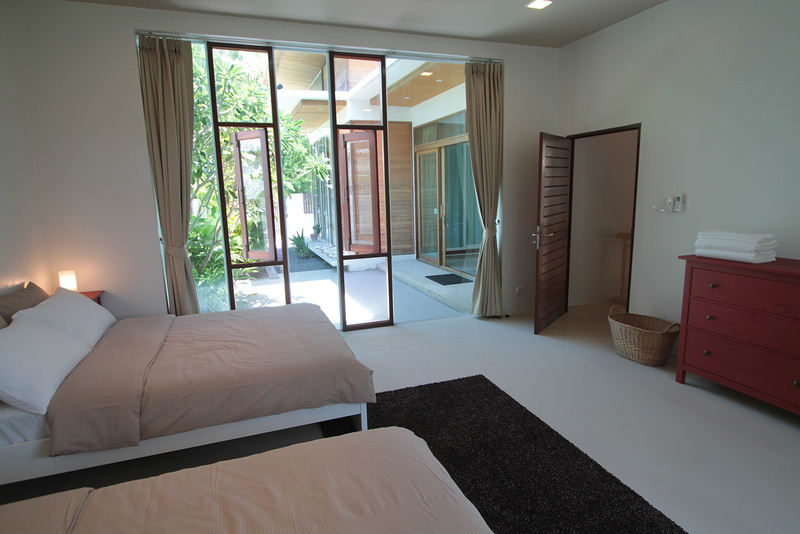 The space is a perfect living area for enjoying the climate on Koh Phangan. The lounge is comfortable with sofa seating for up to eight people, a high pile rug and coffee table. There is a 48 inch LED TV with Netflix and hundreds of movies and a music player which you can plug directly into your smartphone. There is a small office desk complete with chair and plenty of lighting options so you can choose the mood. Within the same area there is a guest toilet with wash basin and another separate bathroom with hot shower. The master bedroom has a high vaulted ceiling and is notably spacious; king-size bed, side tables, 2-seater sofa, high pile rug, beanbags, 40 inch LED TV, various lighting options, walk-in wardrobe and ensuite bathroom with hot shower. Large sliding double doors separate the master bedroom with the sun patio and swimming pool – it is possible to open these doors and lounge poolside while still in the bedroom. The second bedroom has one queen-size double bed, while the third bedroom has two queen-size double beds; both accessed through the breeze lounge. 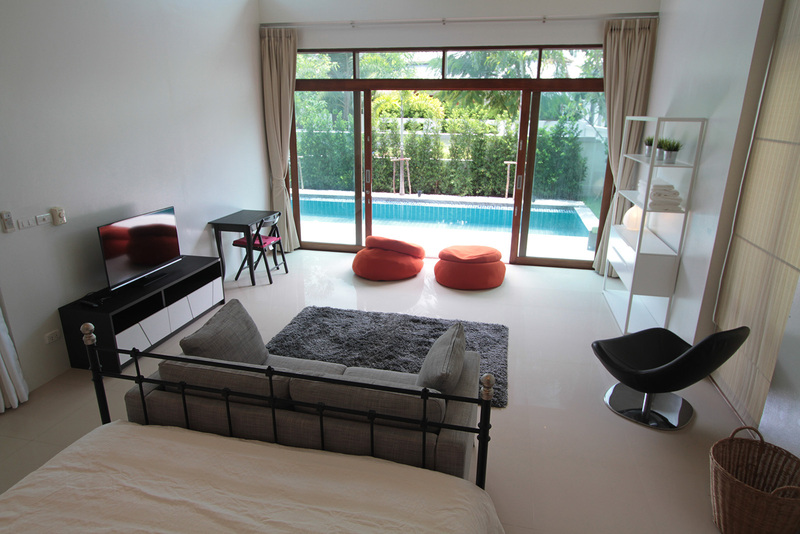 All bedrooms are fully furnished and have air-con, fan, bed linen and towels provided. Maximum occupancy is 8 people (age 8 years old and up). The kitchen is connected to the outdoor pool terrace through 4m wide concertina doors where there is an indoor dining table seating up to eight people. You can look over the swimming pool while preparing food feeling connected to the activity in the villa. Inside the kitchen everything is provided to make self-catering very easy; microwave, fridge, cooker, oven, kettle, toaster, plates, cups and cutlery. You will receive a selection of welcome drinks such as soda water, coca-cola and milk upon arrival to begin your stay with us. There is also drinking water, instant coffee and tea bags provided for no extra charge. 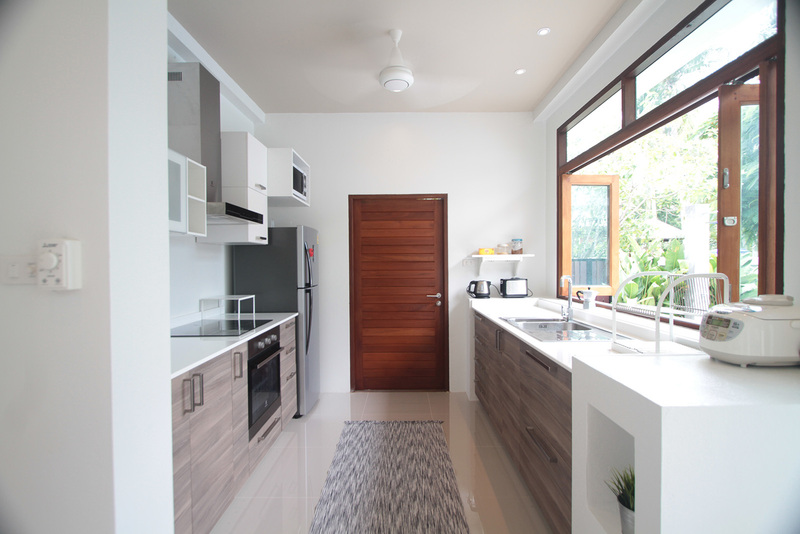 Hidden away at the back of the kitchen is a washing machine and sink suitable for hand washing clothes. Niwana Breeze Villa is child friendly; we welcome all families and can provide extra bedding for up to two small children (age 7 years old and under) free of charge, in particular we have a floor mattress and a baby cot. As part of our facilities we will provide a selection of toys, high chair and a push chair for those booking with children. Netflix is available in the breeze lounge with plenty of children’s favourite TV shows. At the front of the villa there is a private entrance and car parking. For security reasons CCTV is operational at the entrances and around the outside of the villa. The internal area is private with surrounding wall and appropriate planting to soften. Outdoor lighting automatically turns on every evening until midnight. One of the most popular reasons for booking your holiday at Niwana Breeze Villa would be the location; close to many shops, restaurants and markets around the town of Thongsala – famous for a lively atmosphere, especially the local walking street every Saturday from 4pm until late. From Niwana Breeze Villa it is very easy to get to most of the interesting places around the island and organize tours and onward travel.